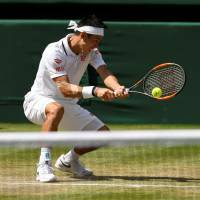 LONDON - Kei Nishikori bowed out of Wimbledon on Wednesday after losing to Novak Djokovic 6-3, 3-6, 6-2, 6-2 in the quarterfinals. The loss marks the end of world No. 28 Nishikori’s most successful ever Wimbledon appearance, having reached the final eight for the first time in his career. Having broken Nishikori early in the first set, 21st-ranked Djokovic went on to surrender his subsequent serve with a double fault at break point, and Nishikori served to draw even at 3-3. However, he later handed Djokovic another break with a wide backhand, allowing Djokovic to serve out and take a comfortable first set. He then failed to convert three crucial break opportunities on Djokovic’s serve at 2-2 in the third set, giving away the game and then his next two serves to hand the Serb his second set. After breaking Djokovic’s first serve to get off to a promising start in the fourth set, Nishikori was immediately relinquished of his lead as Djokovic broke back once and then again. A final break clinched with a forehand winner, and the match was lost. “He was playing very deep, he was going both sides with his back and then his forehand too . . . he was making me run all the time. Honestly, it’s not easy playing Novak,” Nishikori said. 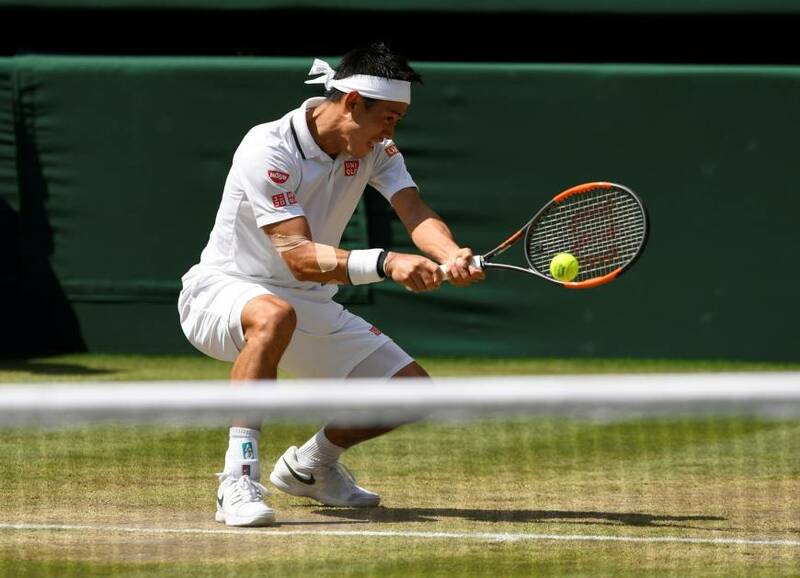 Victory always appeared likely to be a tall order for Nishikori, who has lost to three-time Wimbledon champion Djokovic in 13 of 15 previous matches. He last beat him at the semifinals of the U.S. Open in 2014, where he reached the final in his best ever performance at a Grand Slam. “It gives me confidence that I was able to play good tennis on grass,” Nishikori said. “I’m frustrated to lose today, but these two weeks have helped me going forward. Eight-time champion Roger Federer was sensationally knocked out by South African giant Kevin Anderson while Rafael Nadal edged Juan Martin del Potro in a Centre Court epic and will meet Djokovic in the semifinals. Defending champion Federer lost a Court One thriller, 2-6, 6-7 (5-7), 7-5, 6-4, 13-11 as 32-year-old Anderson became the first South African in the Wimbledon semifinals since Kevin Curren in 1983. In a nail-biting 4-hour and 13-minute classic, it was 36-year-old Federer’s earliest exit at the All England Club since his shock second round defeat against Sergiy Stakhovsky in 2013. “Sometimes you don’t feel good, and you try your best. Today was one of those days. I didn’t see it coming,” said Federer. Eighth seed Anderson will play American ninth seed John Isner on Friday for a place in Sunday’s final. Djokovic will face old rival and world No. 1 Nadal, who saw off Del Potro 7-5, 6-7 (7-9), 4-6, 6-4, 6-4 after 4 hours and 48 minutes on Centre Court to reach his sixth Wimbledon semifinal and 28th at the majors. For the only the second time at Wimbledon, Federer was beaten after holding a two-set lead, with his previous loss from that position coming against Jo-Wilfried Tsonga in the 2011 quarterfinals. The 20-time Grand Slam champion appeared to be moving toward his fifth successive Wimbledon semifinal after taking the opening two sets. That initial burst gave Federer 34 successive sets won at Wimbledon, equaling his own record set between 2005 and 2006. Ninth seed Isner made the semifinals of a major for the first time with a 6-7 (5-7), 7-6 (9-7), 6-4, 6-3 win over 2016 runner-up Milos Raonic.